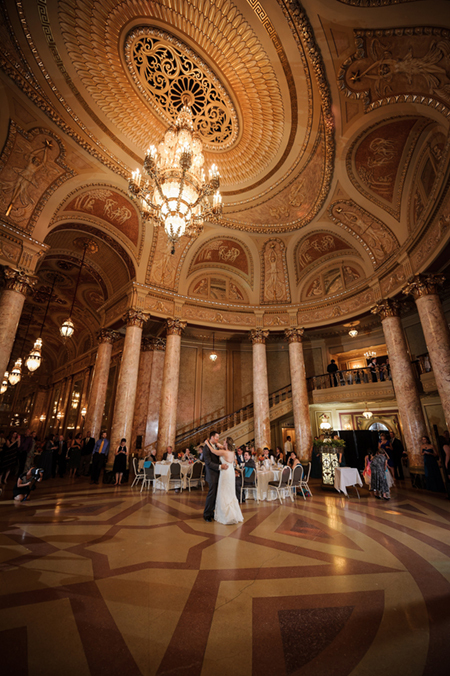 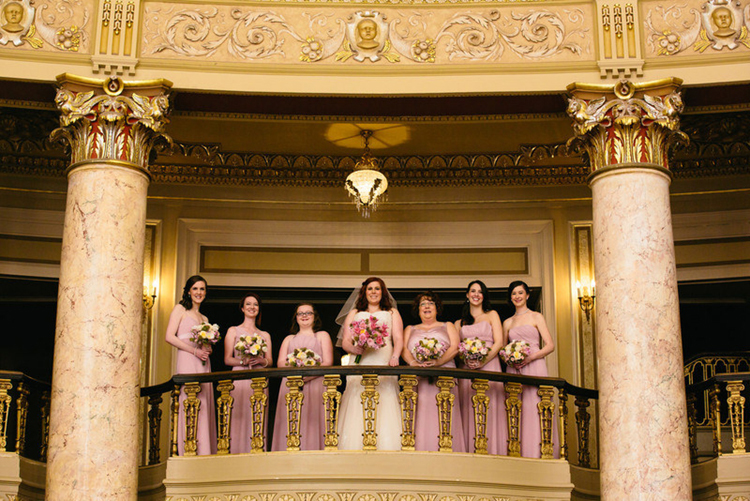 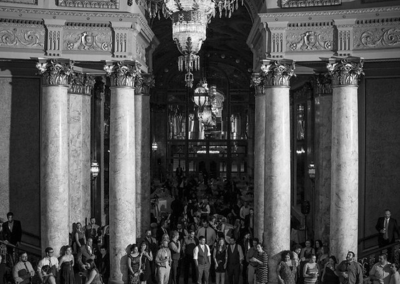 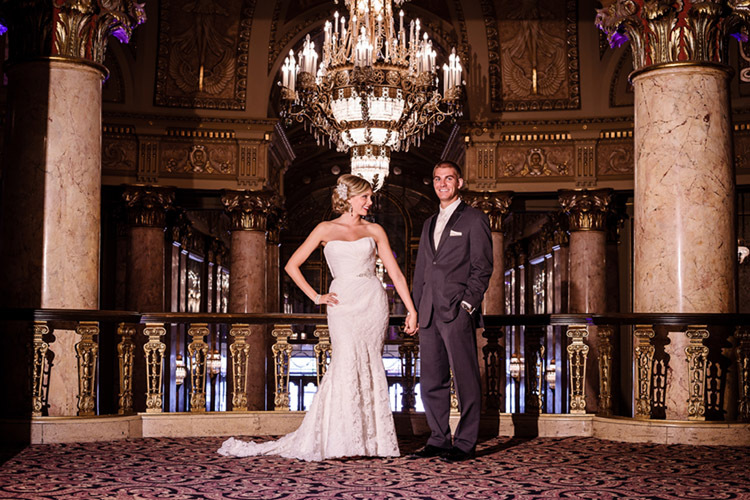 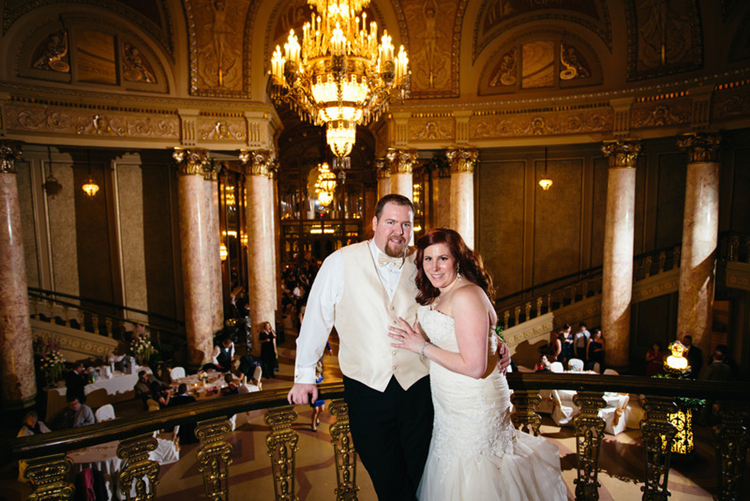 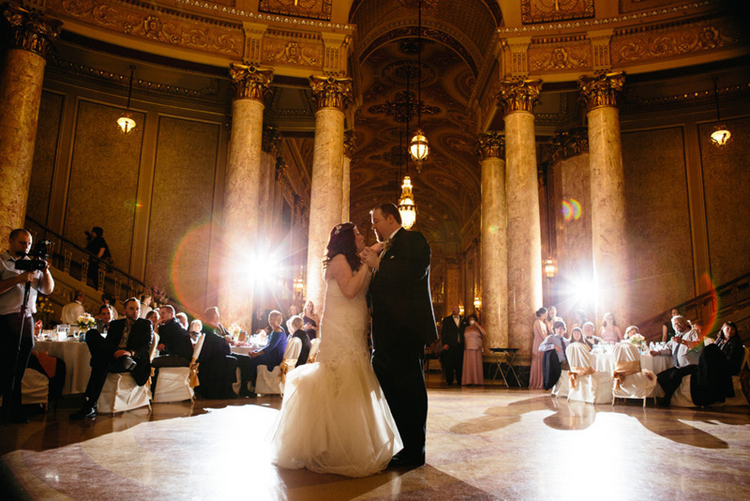 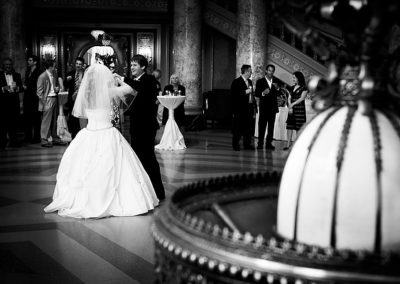 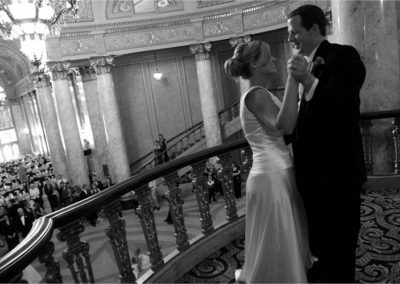 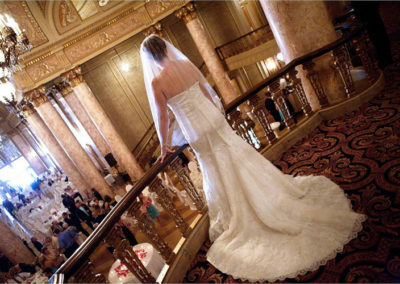 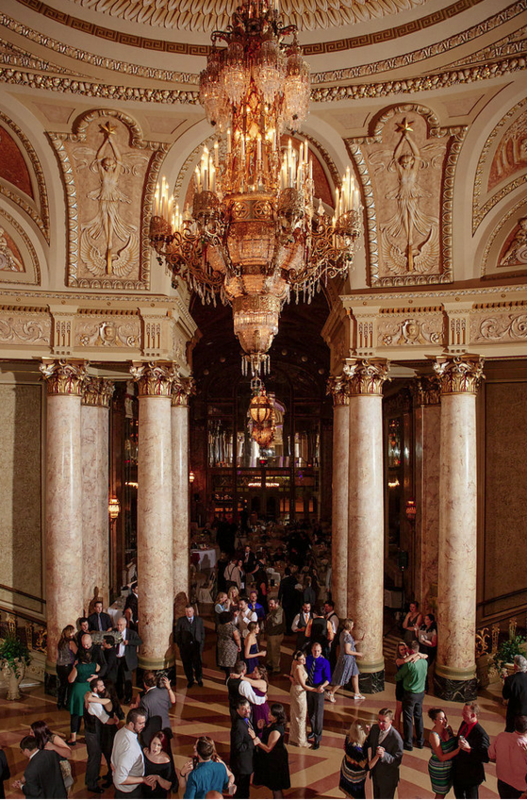 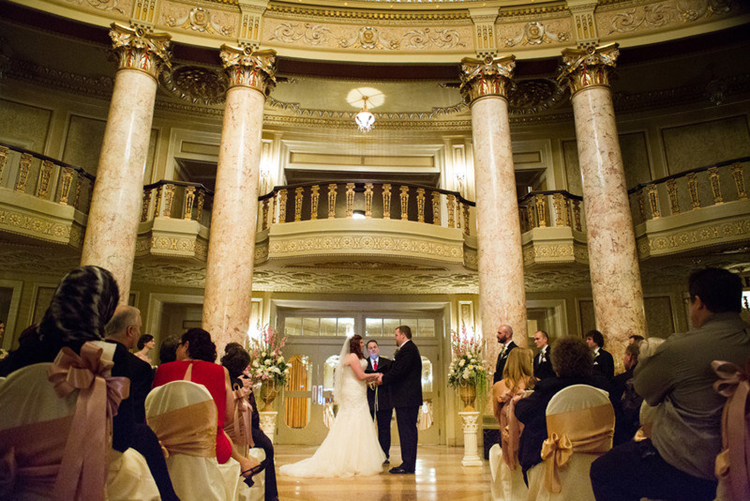 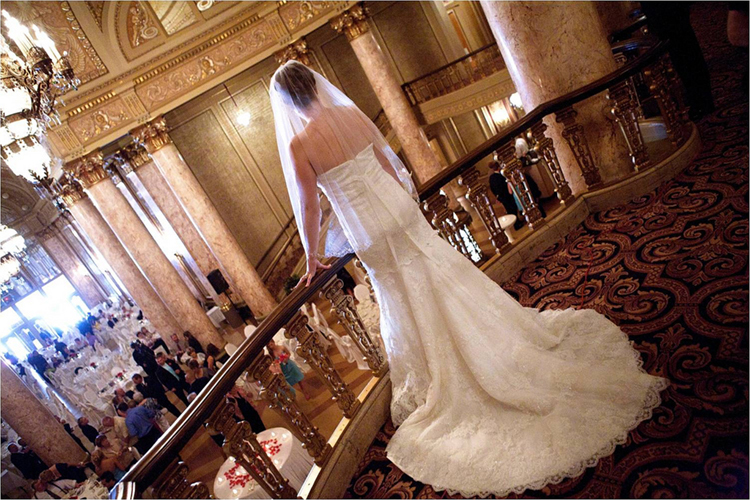 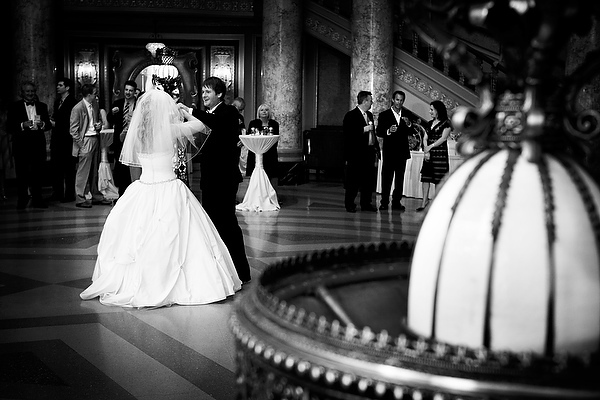 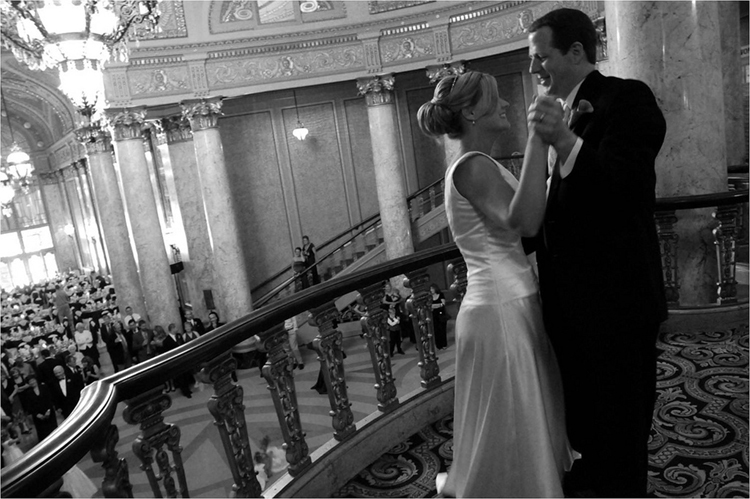 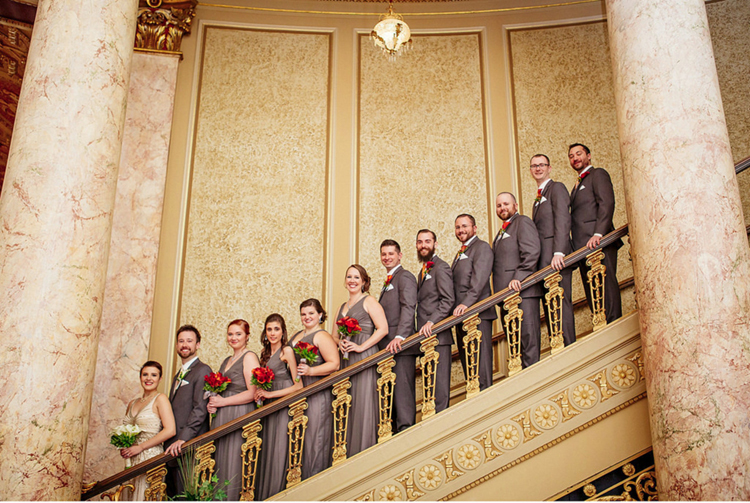 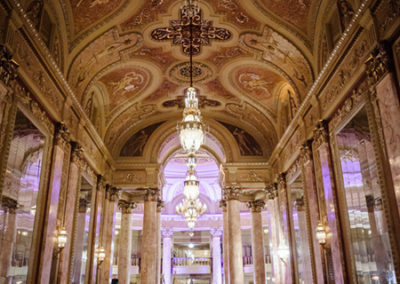 Imagine walking down the magnificent steps of the grand staircase in the Rialto’s Rotunda and greeting your guests for a once-in-a-lifetime storybook wedding. 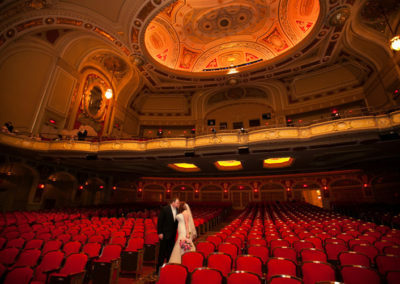 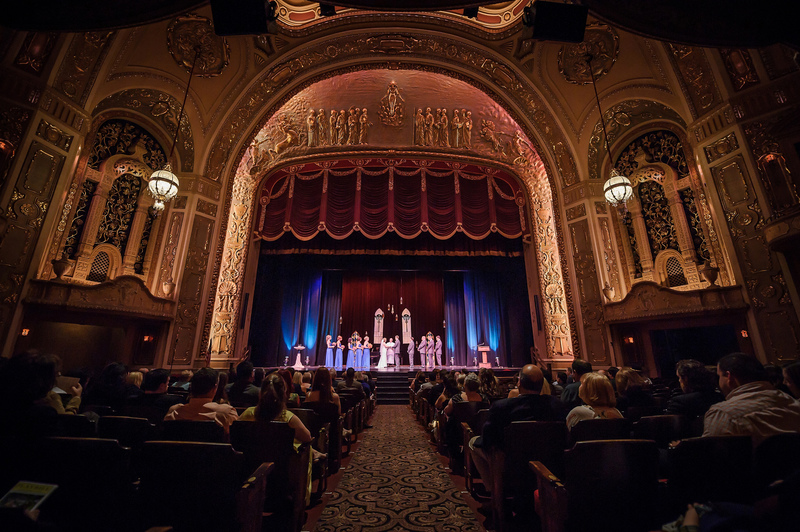 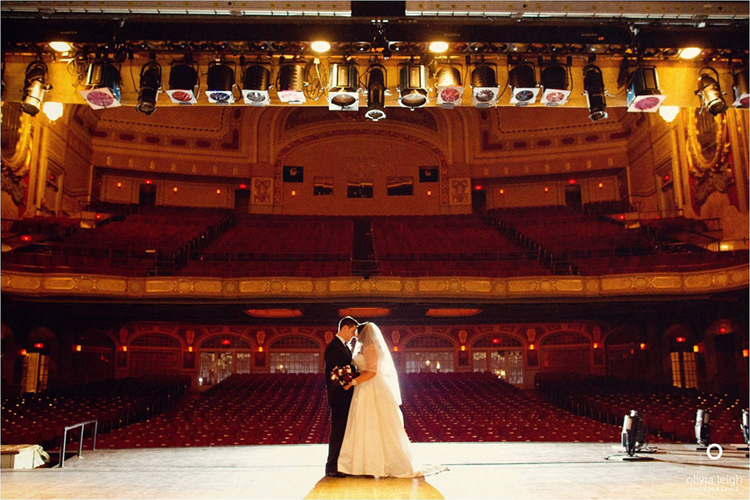 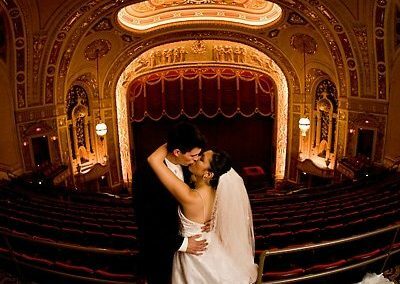 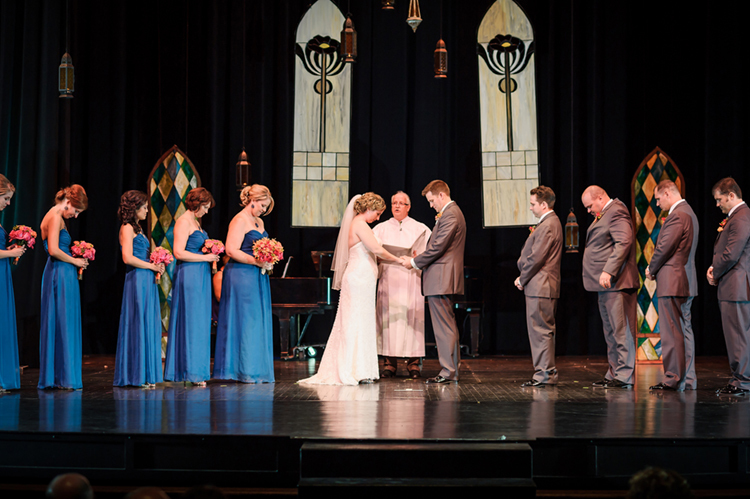 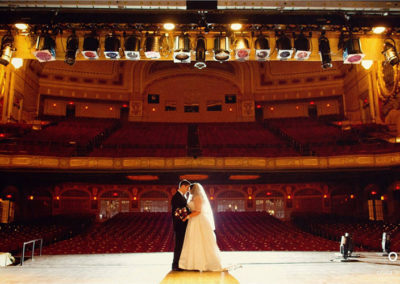 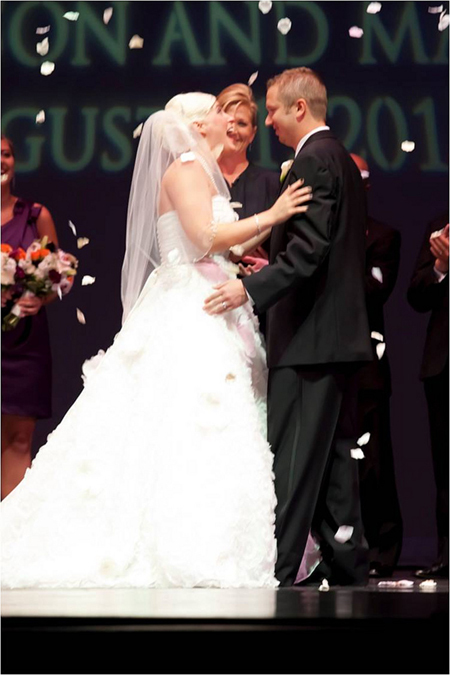 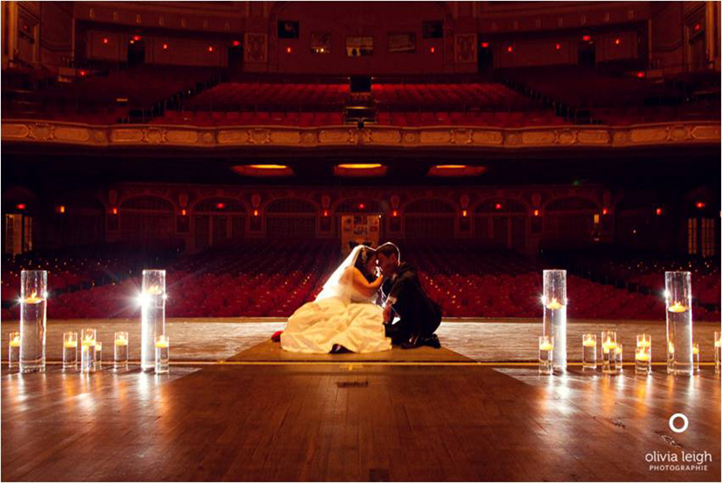 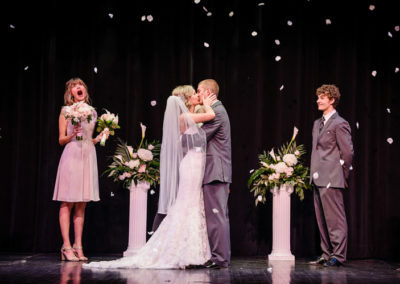 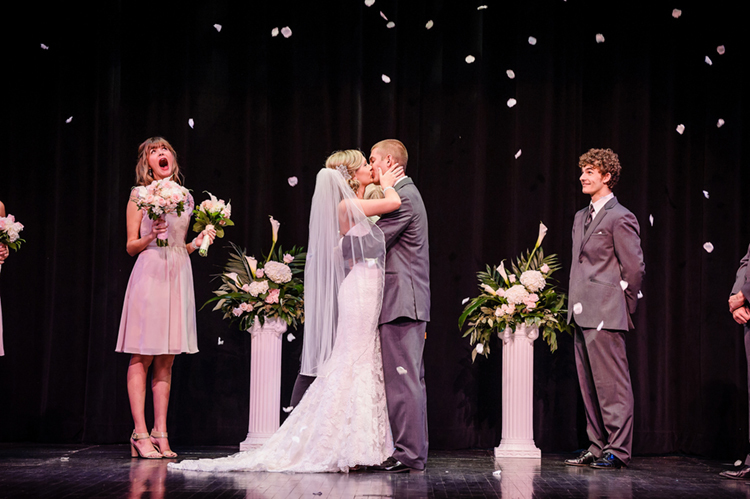 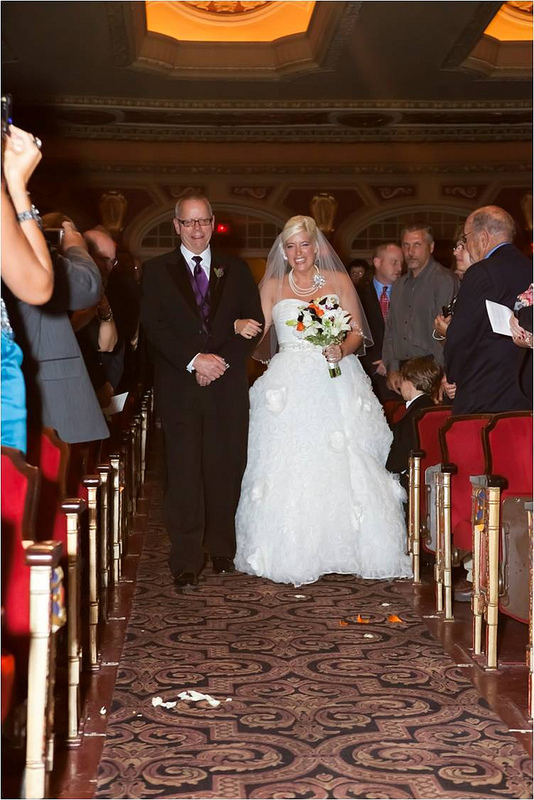 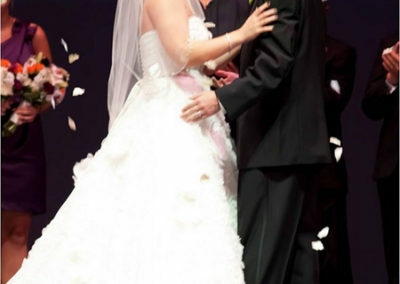 Or having a one of a kind ceremony on our stage in the theatre watching your groom / groomsmen rise up on our orchestra pit, and at your first kiss as man and wife we will cascade you with a flower pedals! 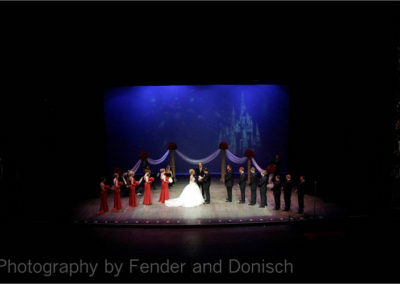 Your first dance as man and wife will be crowned by the majestic “Duchess” chandelier. 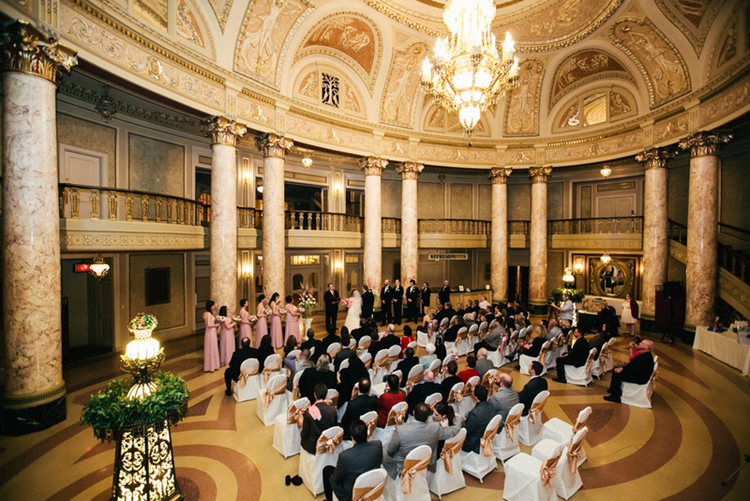 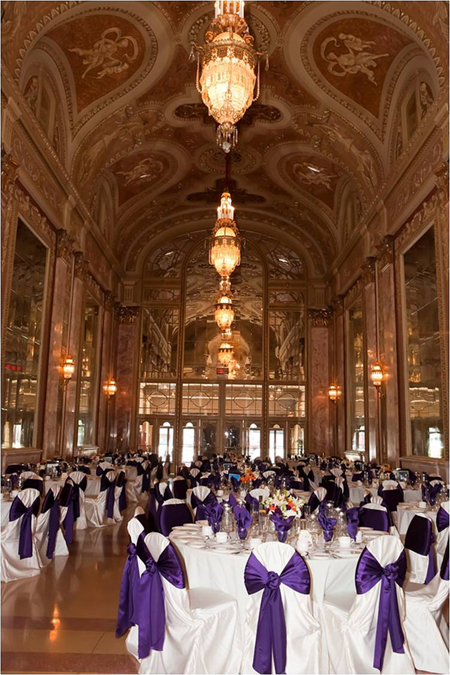 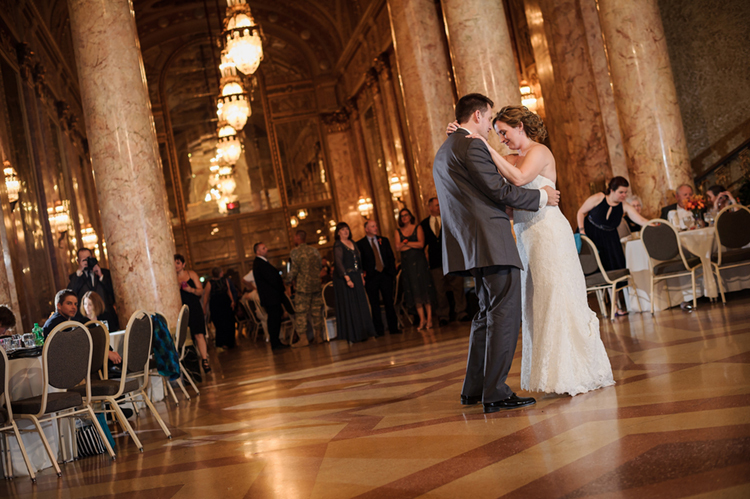 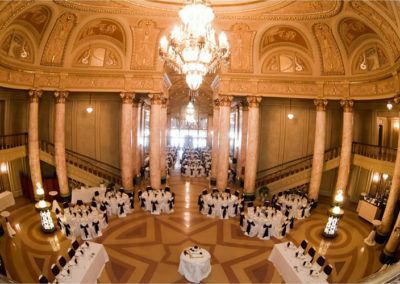 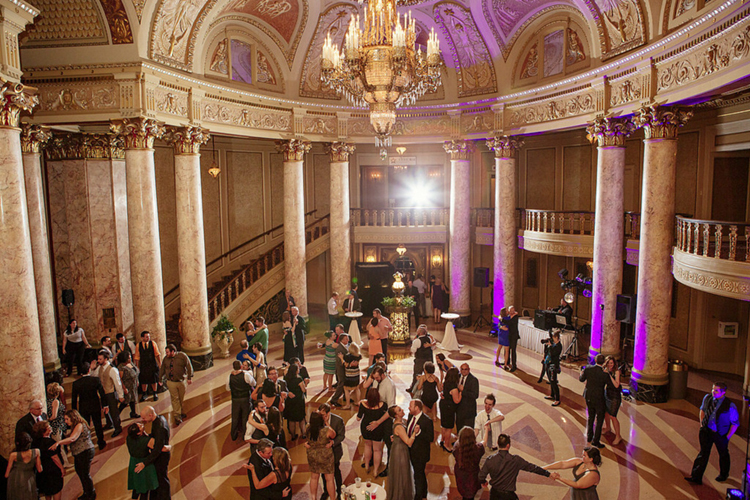 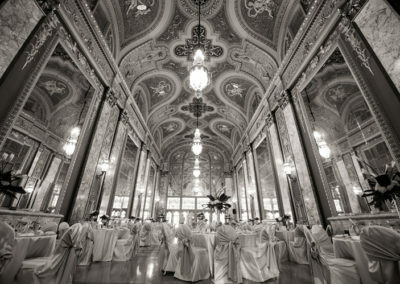 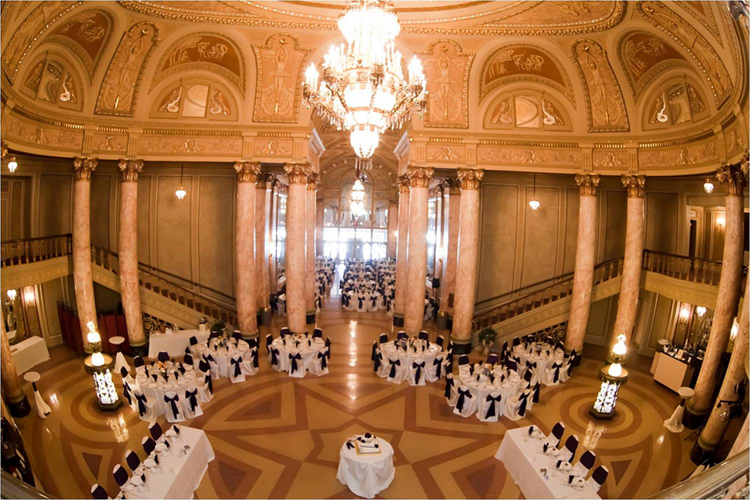 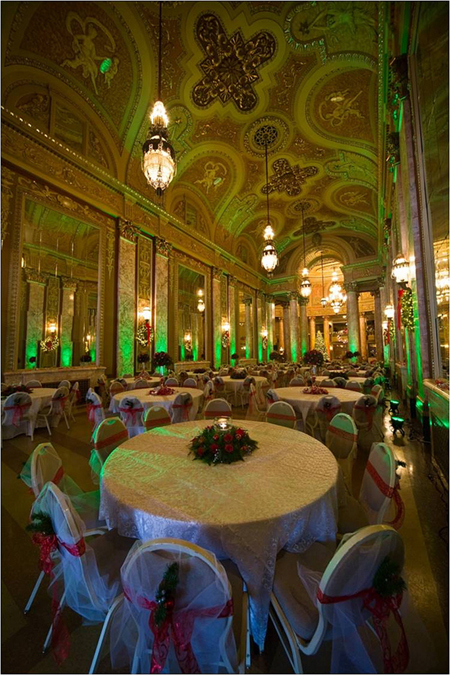 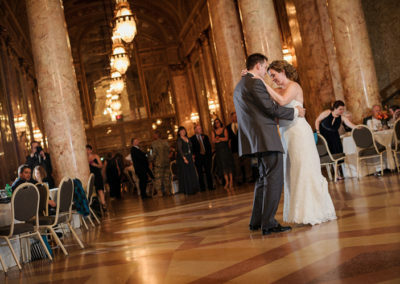 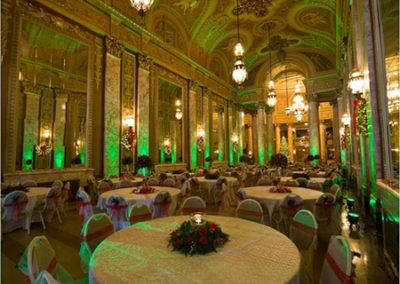 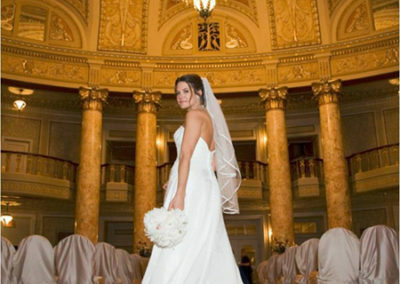 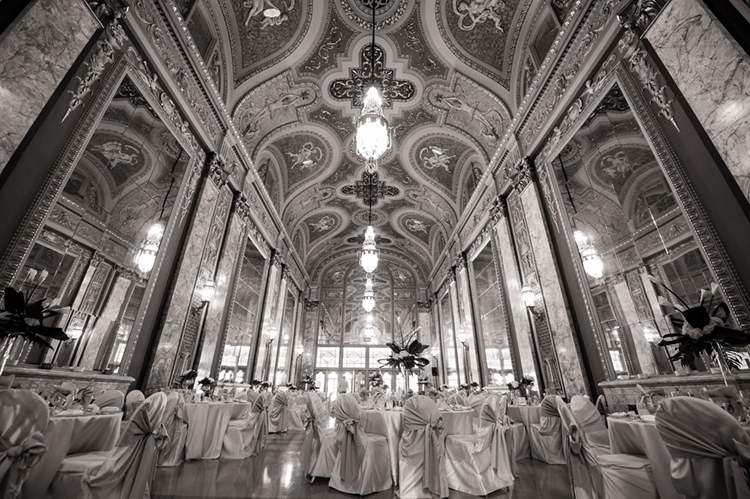 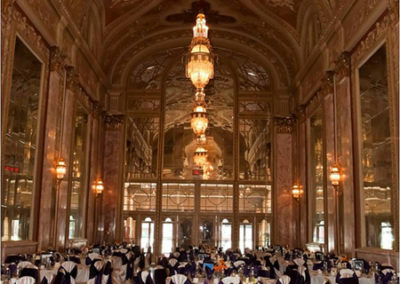 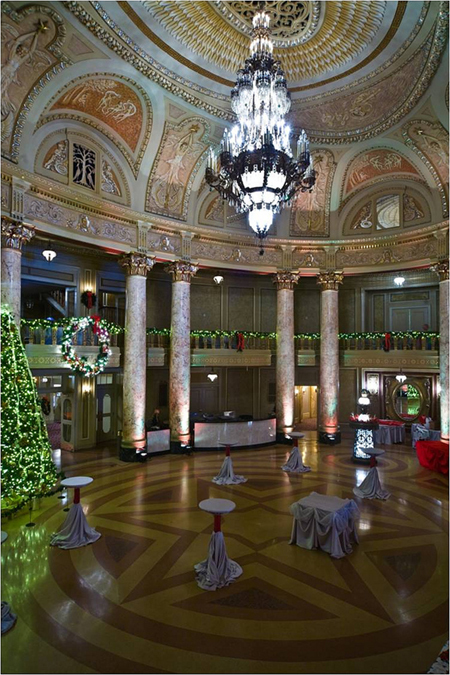 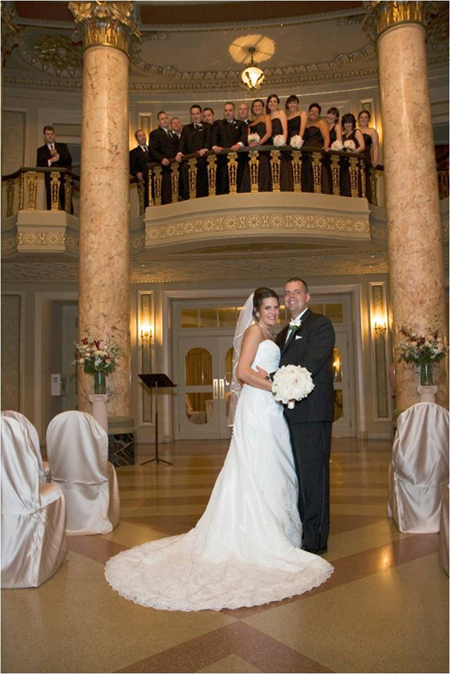 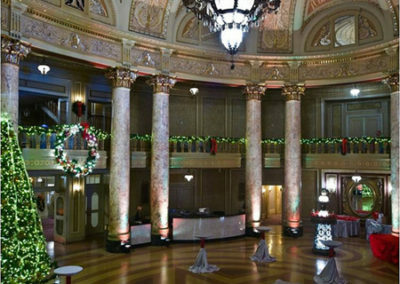 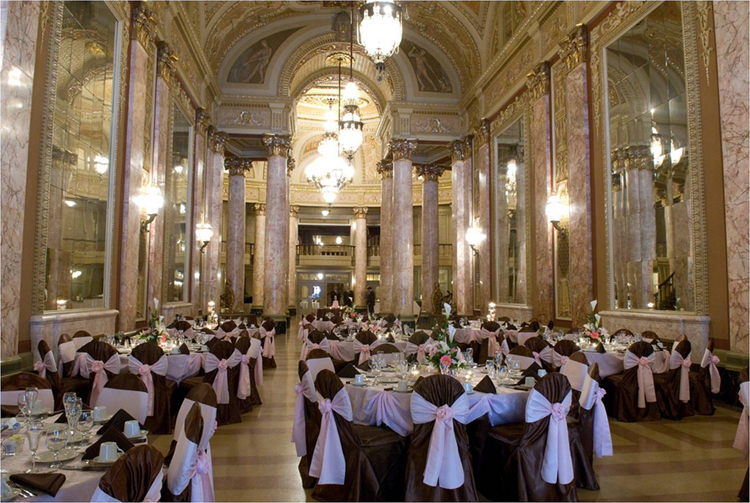 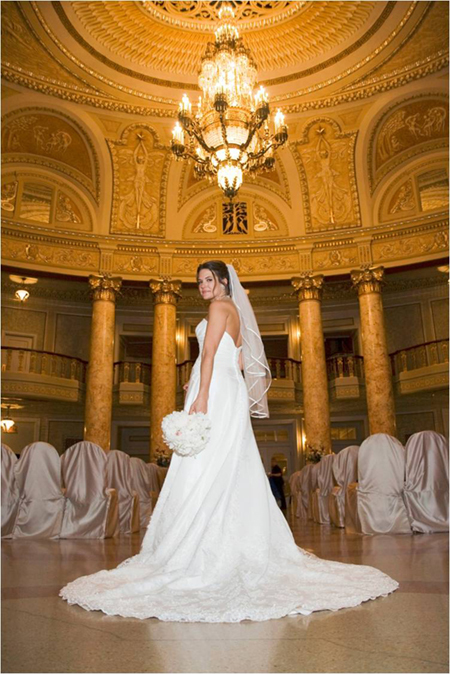 Host your wedding ceremony, reception or both in this elegant, historic setting. 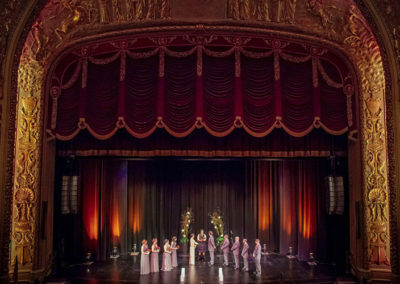 Includes: 2 bars; high boys; cocktail tables and chairs; use of piano; up lighting against black velvet curtains; chandeliers hanging over stage; use of gobos projected on the back wall (GOBO additional charge); music playing; use of mics for intros. 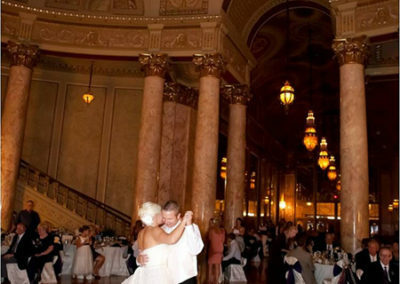 The sale and service of alcoholic beverages are regulated by the State of Illinois and the City of Joliet. 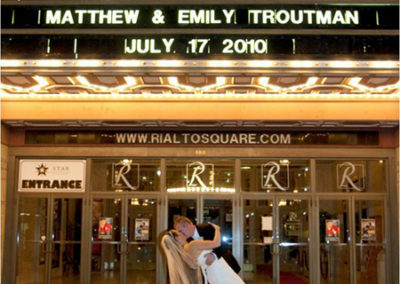 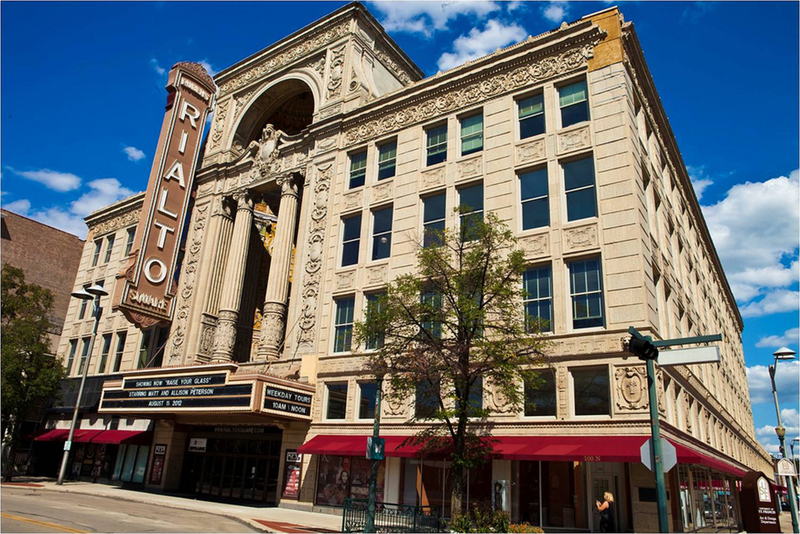 Rialto Square Theatre, as a licensee is responsible for the administration of these regulations. 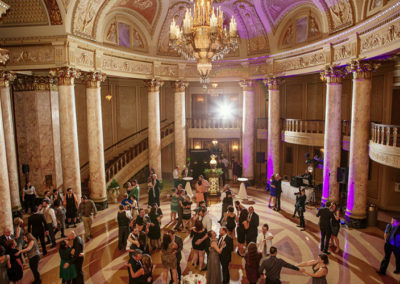 Therefore, liquor cannot be brought into the buildings or premises from outside sources. 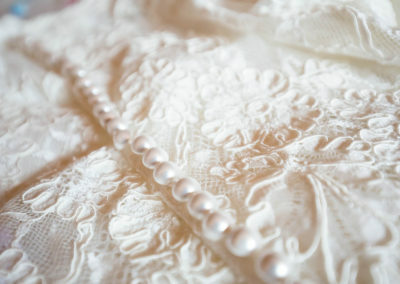 It will be confiscated and disposed of. 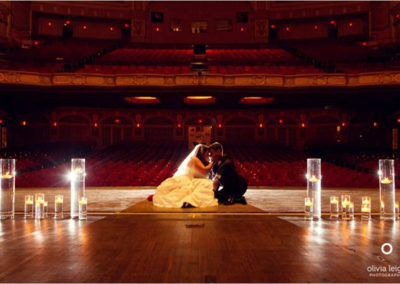 Special requests will be granted upon availability. 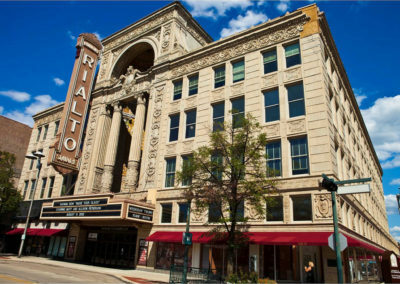 The Rialto reserves the right to require proof of age, as well as not to serve any individual in order to comply with these regulations. 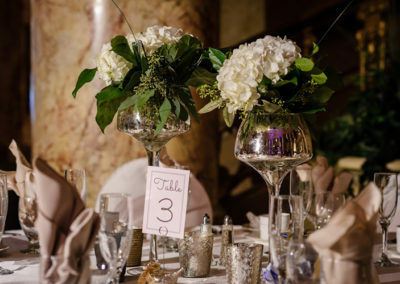 Alcoholic beverages may be harmful to pregnant women. 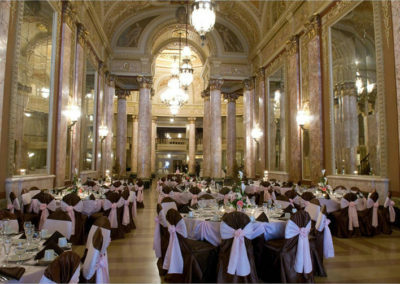 To host a ceremony, you must purchase the reception package. 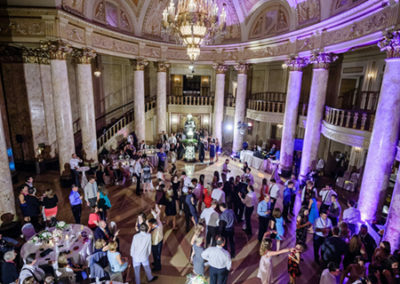 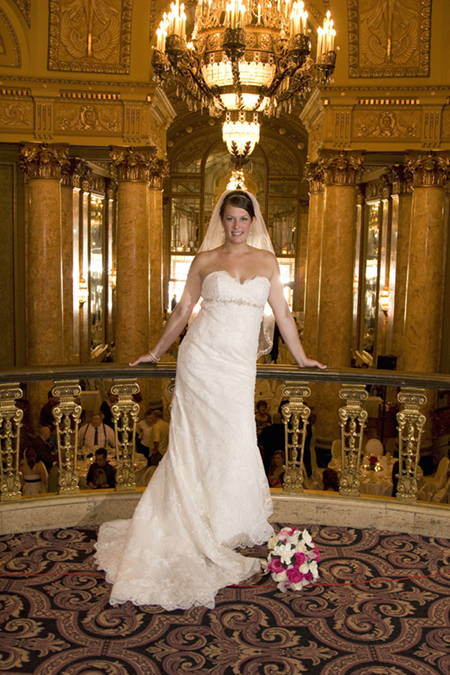 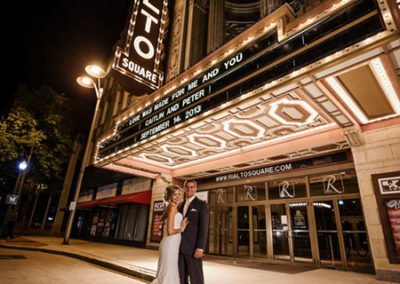 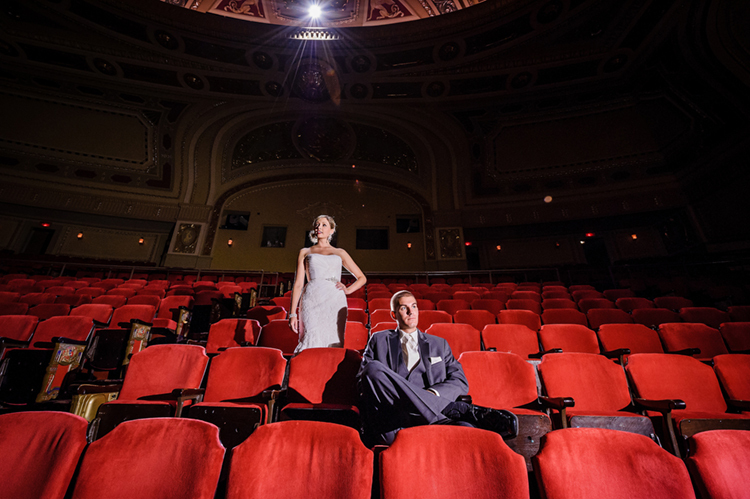 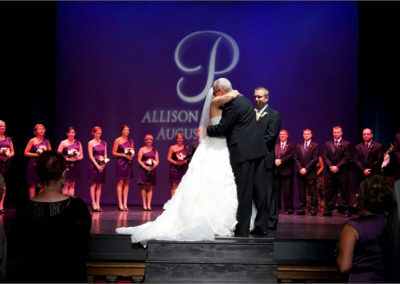 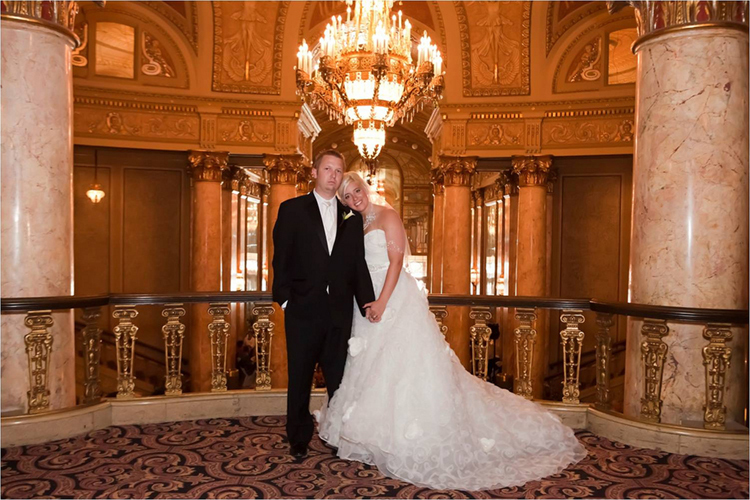 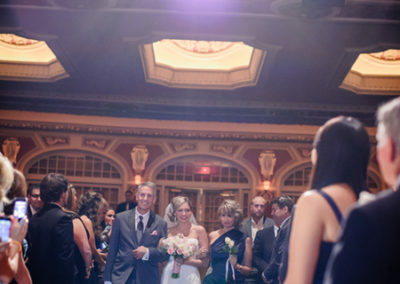 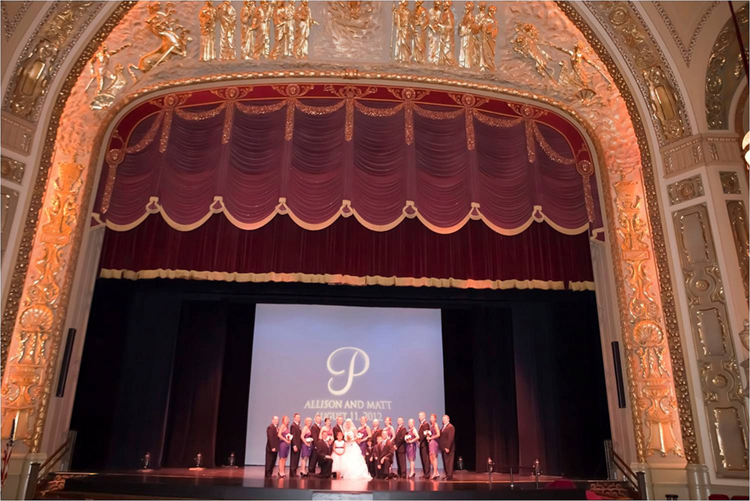 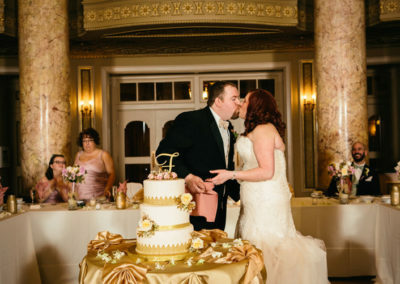 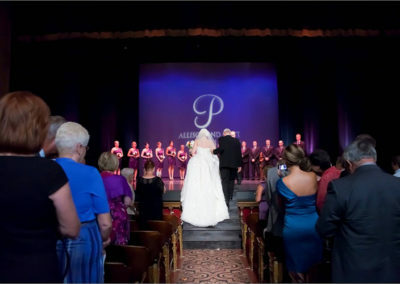 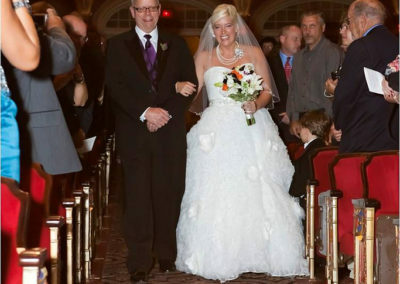 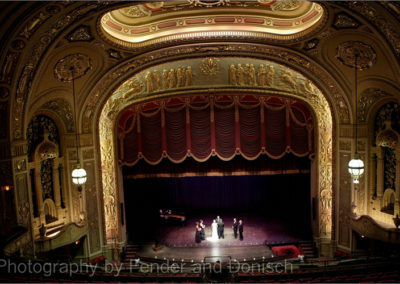 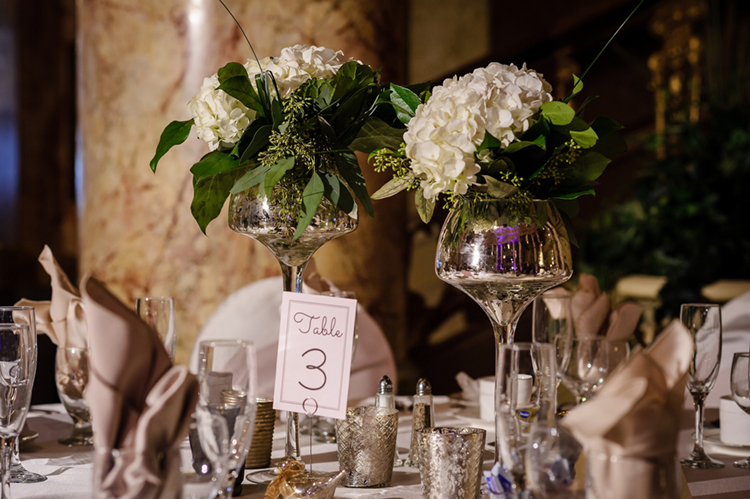 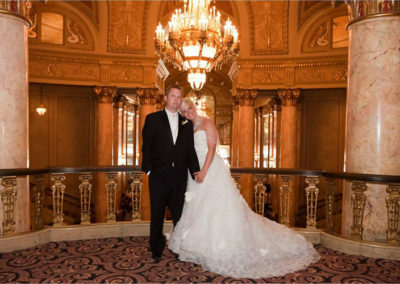 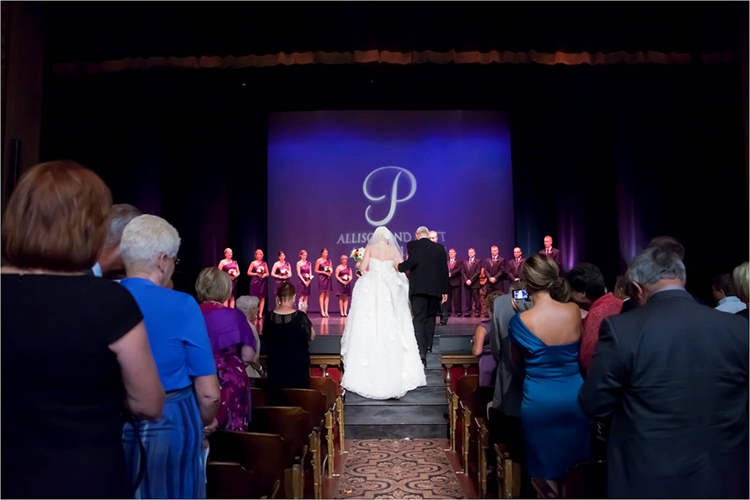 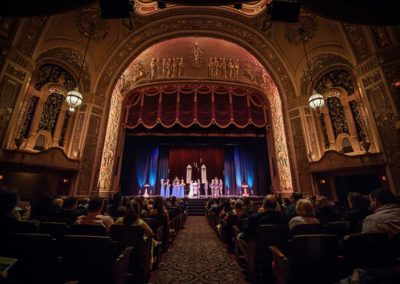 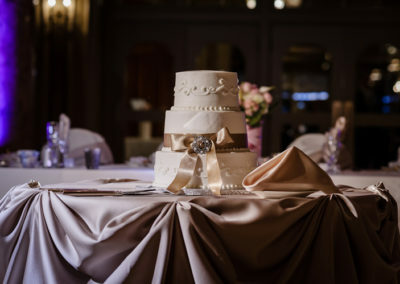 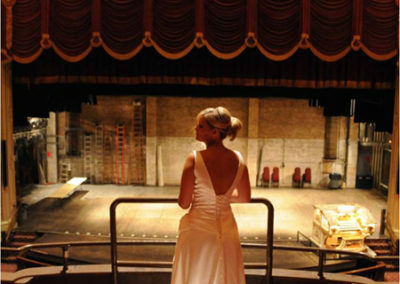 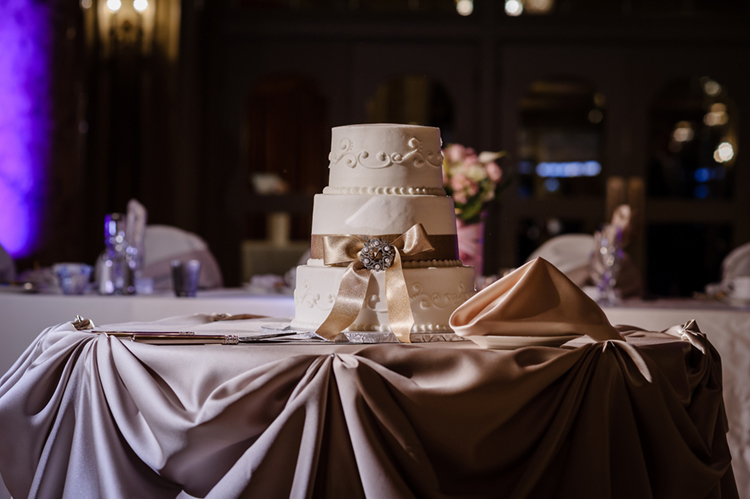 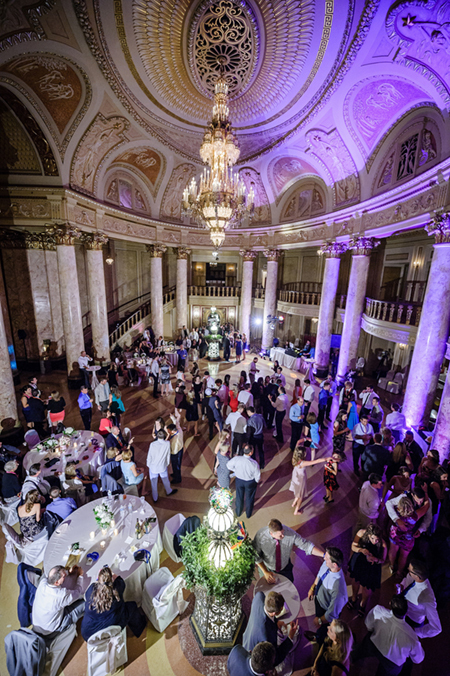 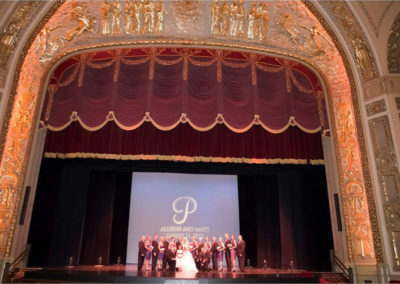 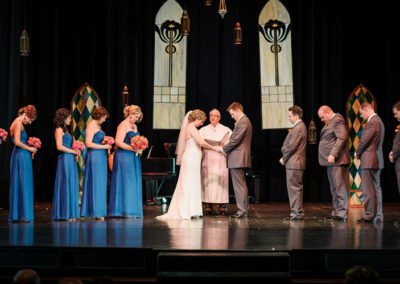 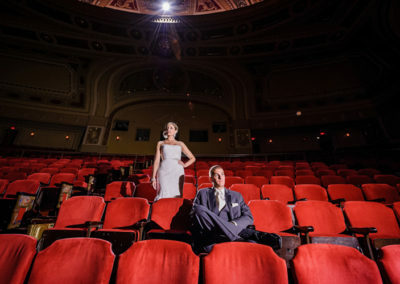 View a list of companies that have the experience and the know how to make your Wedding ceremony and reception run smoothly at the Rialto. 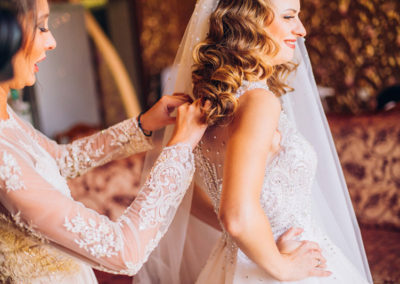 There is no need to get a hotel room for you and your bridesmaids to get ready in. 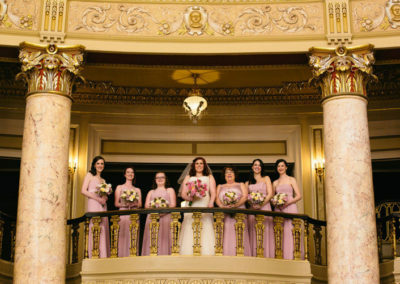 Sip on Champagne as your bridal party gets dressed in our beautiful Bridal Suite! 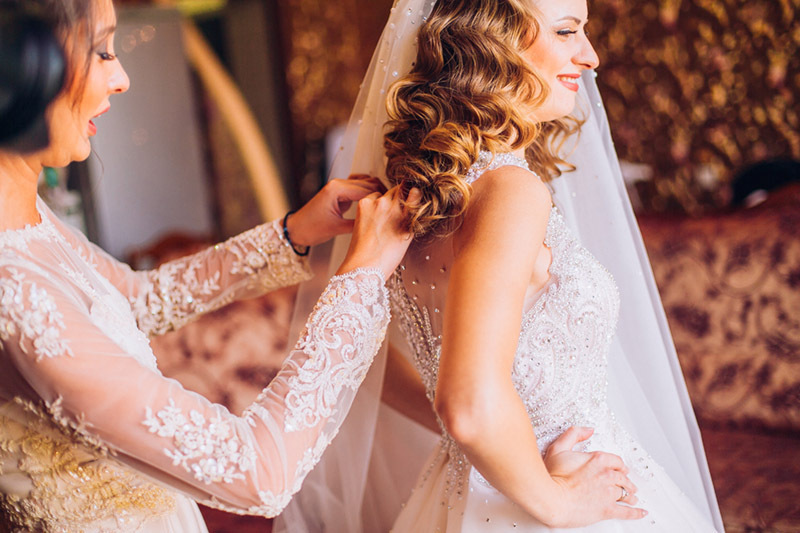 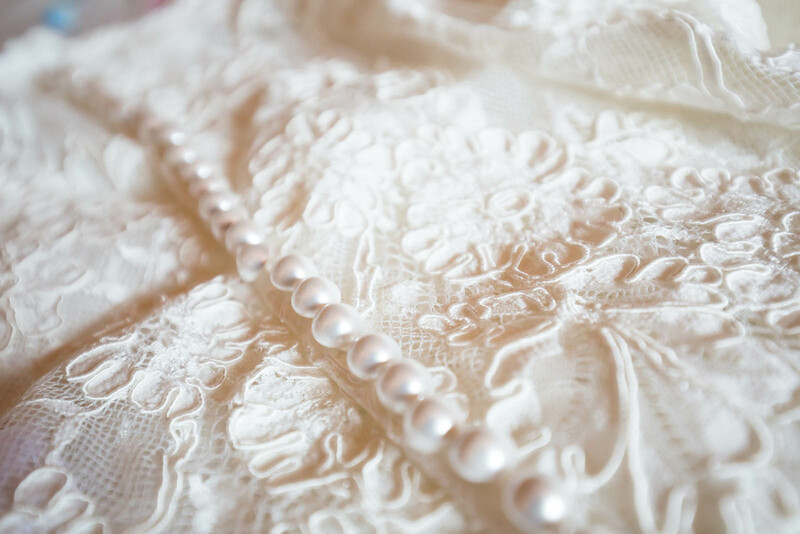 Your Bridal Suite comes with one bottle of Champagne, private restrooms, table and chairs, mirrors, you may use the bridal suite up to four hours prior to your ceremony. 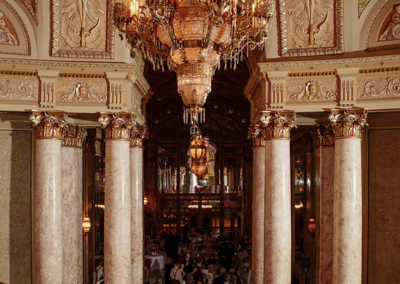 You may also order light appetizers for an additional cost. 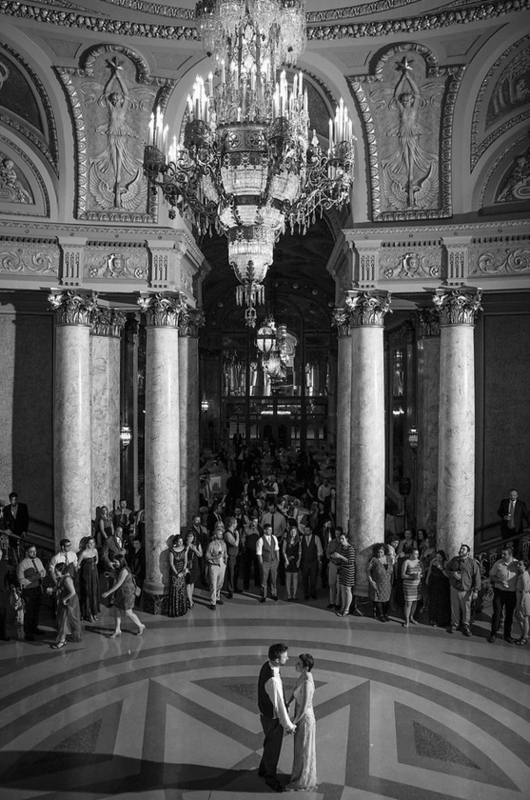 Please note outside alcohol is prohibited in our building. 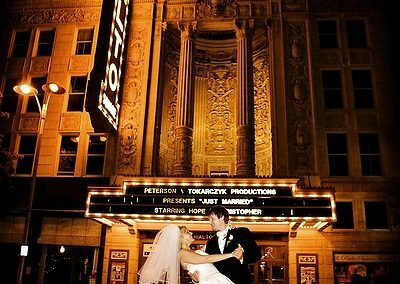 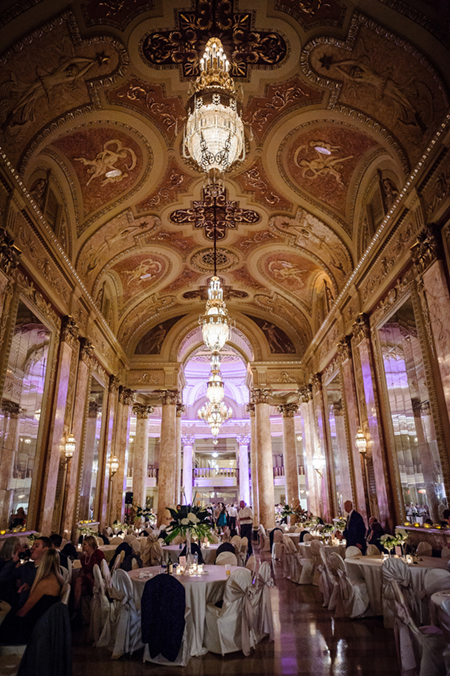 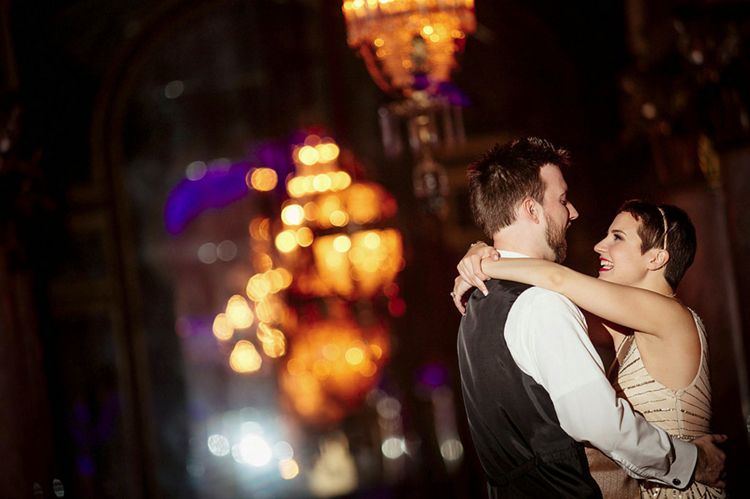 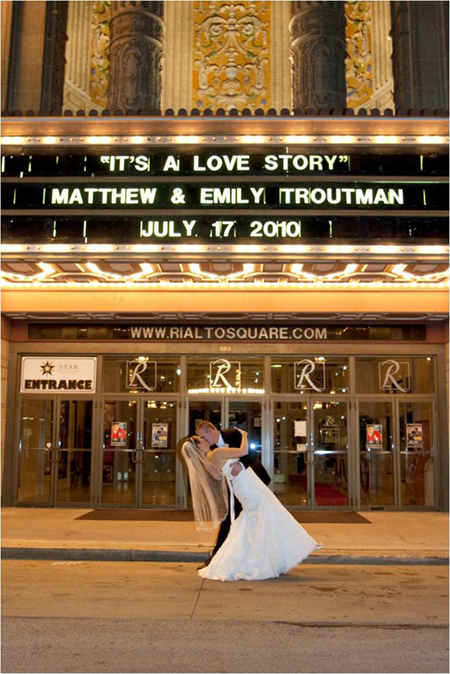 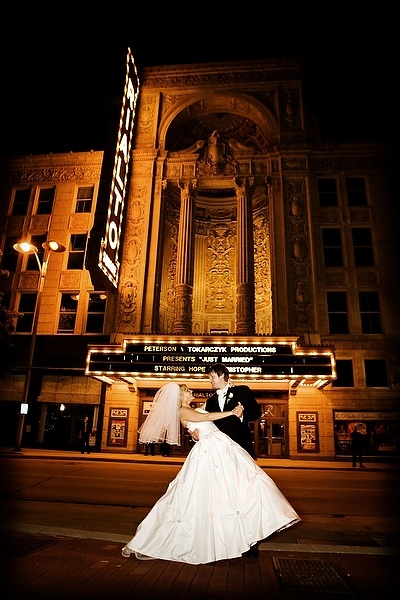 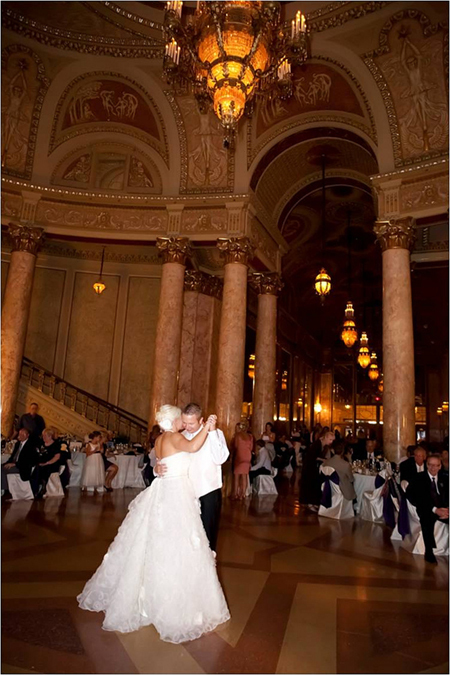 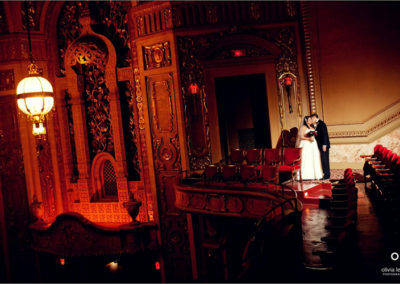 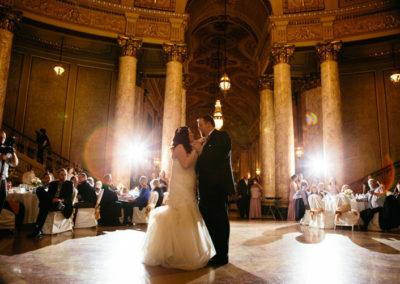 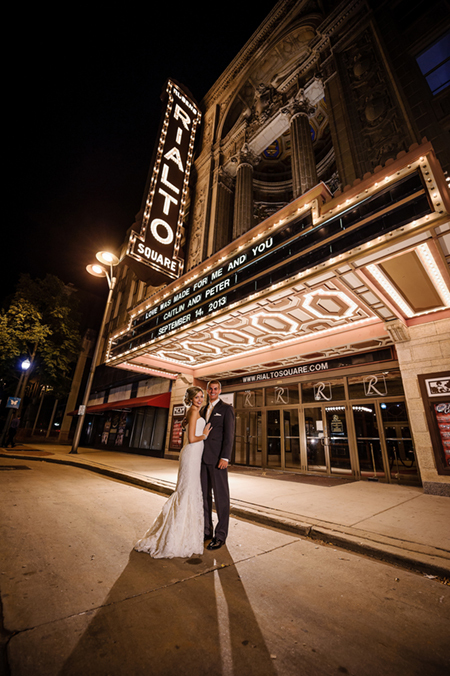 The Rialto is the perfect setting for a romantic wedding! 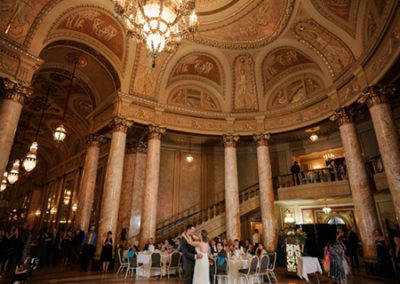 The venue was absolutely gorgeous! 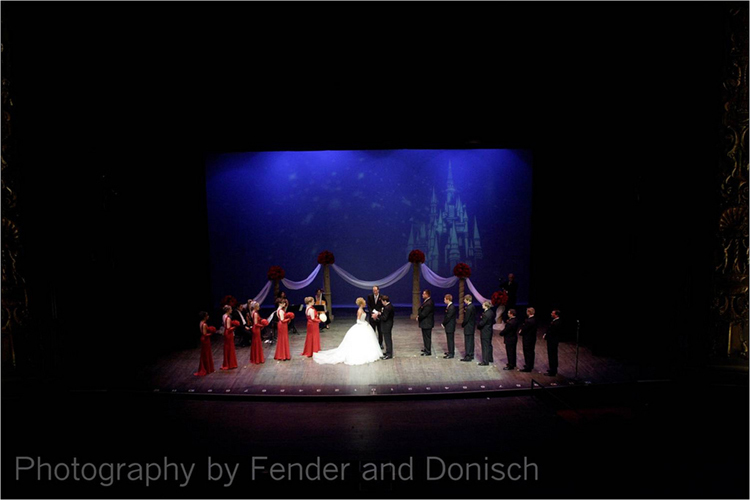 Everything was perfect and all the guests commented on how amazing it was! 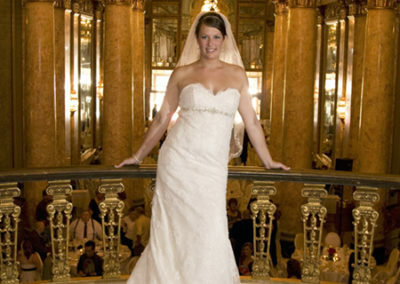 Emily B. 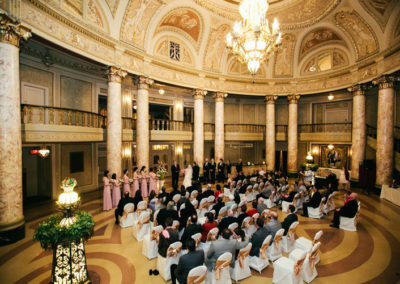 What a beautiful setting for our wedding. 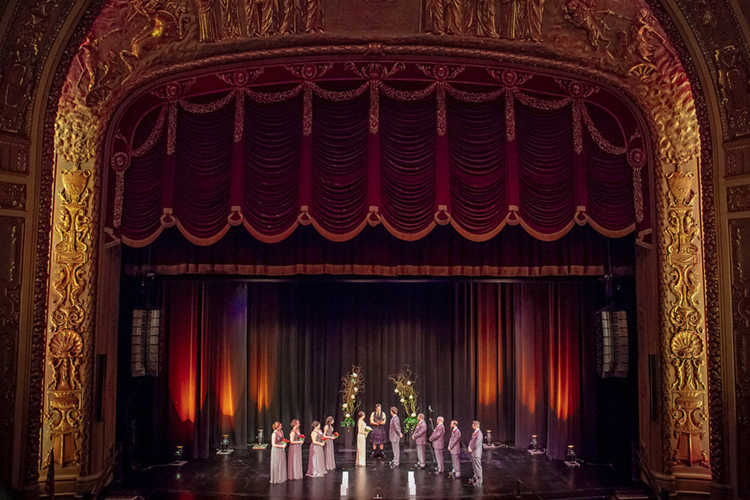 The venue was amazing and so was the staff. 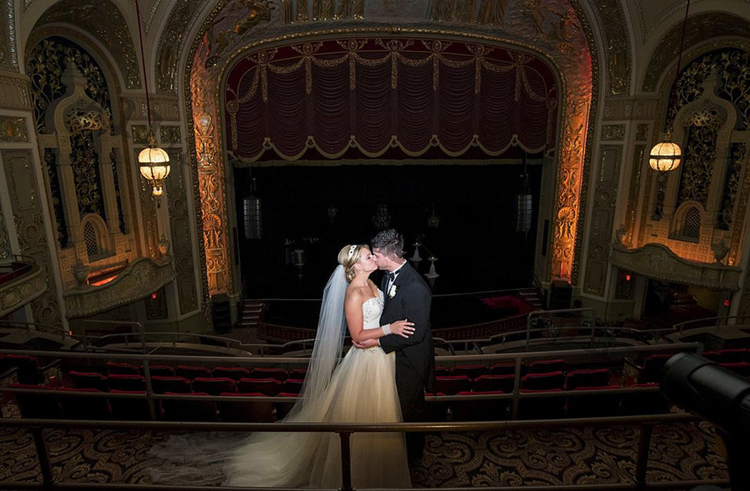 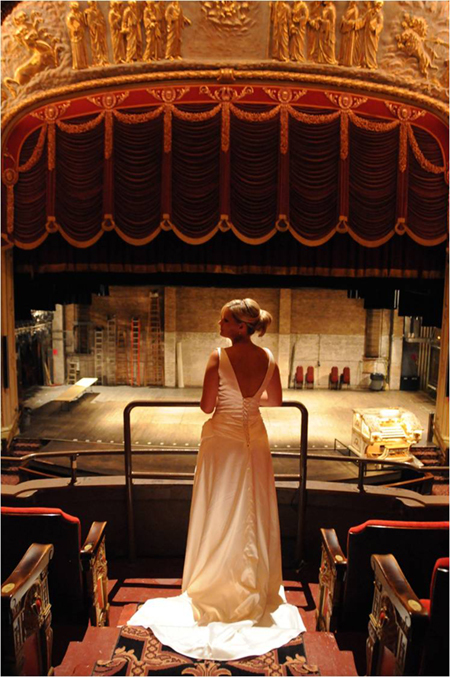 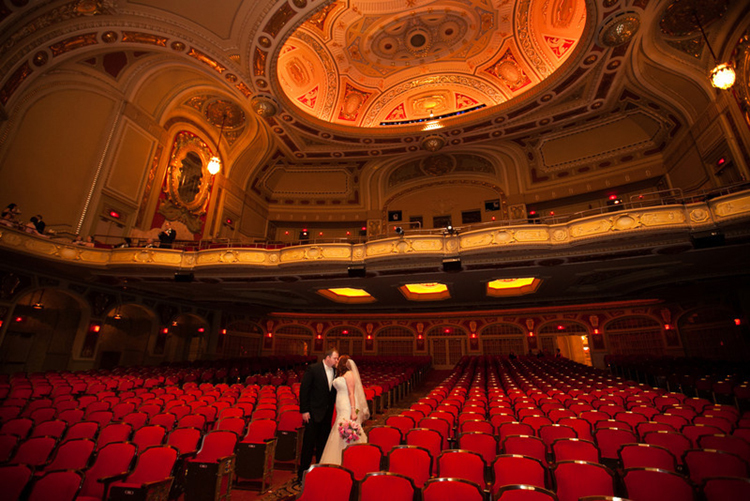 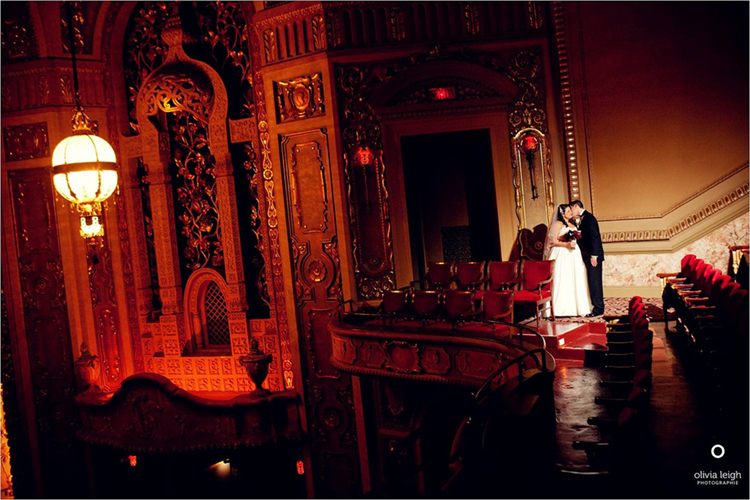 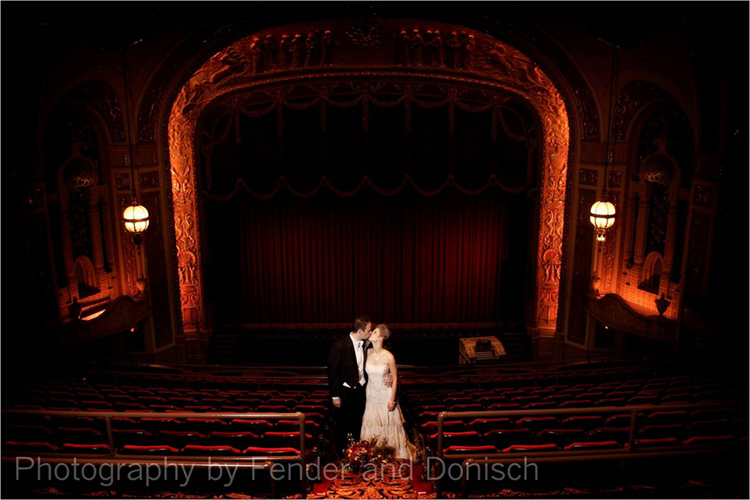 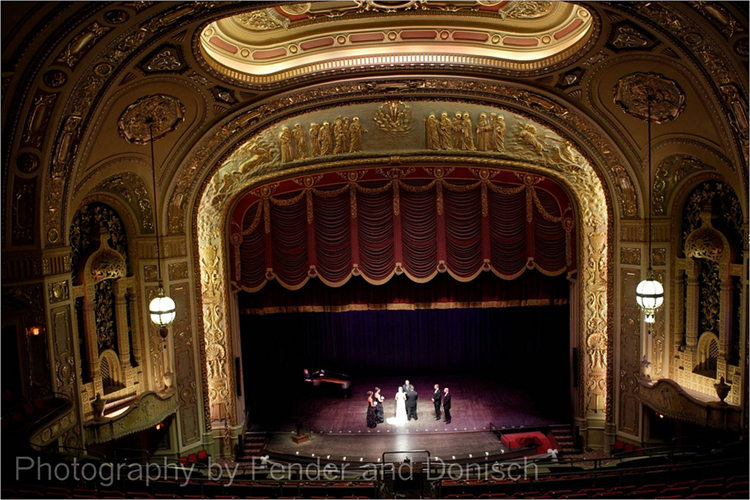 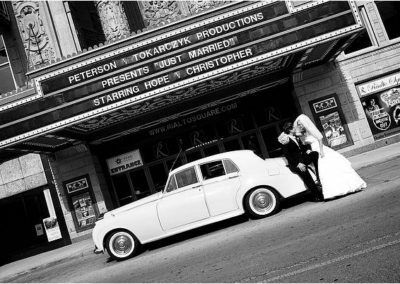 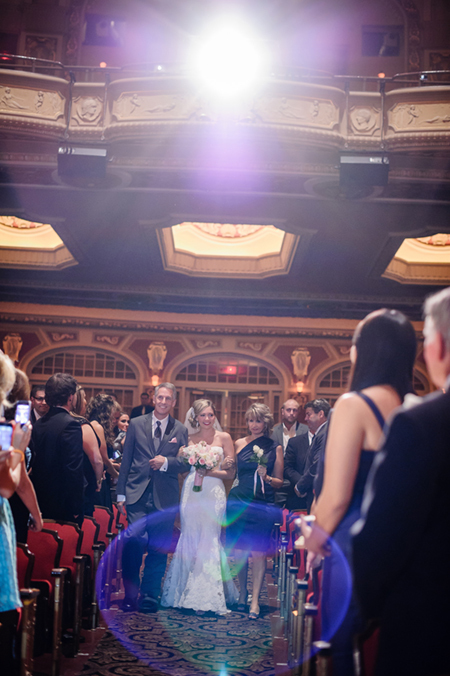 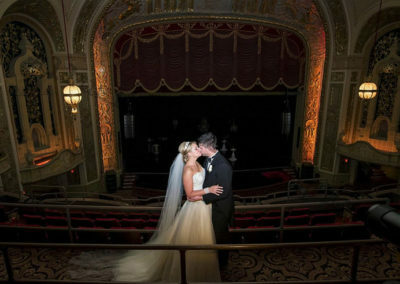 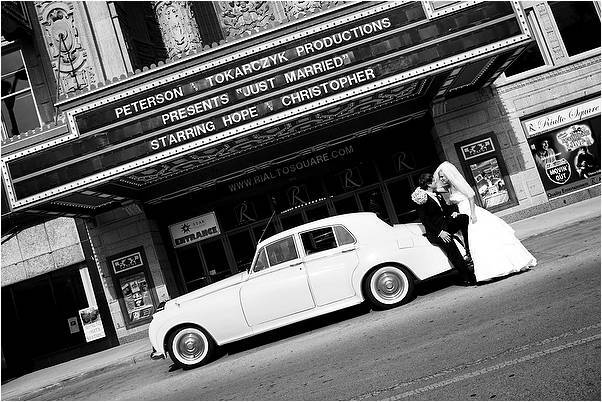 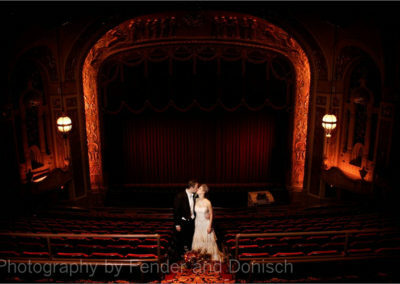 All of our guests LOVED the theatre and it made for great pictures! 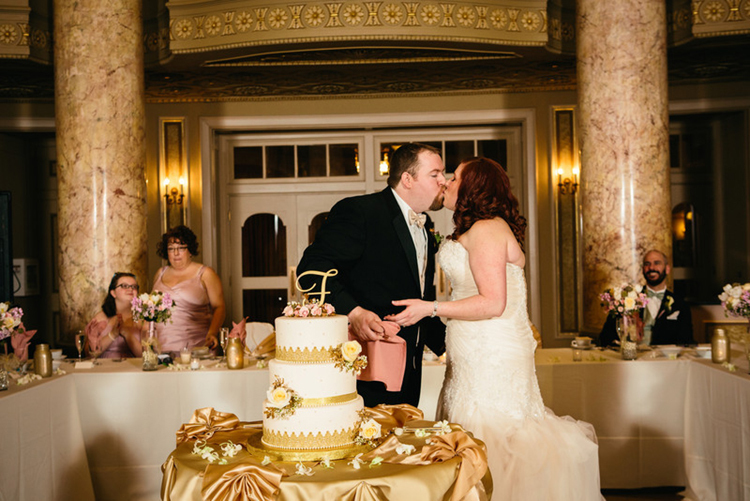 Kari S.
“Nancy is absolutely amazing and kept our wedding day 100% stress free. 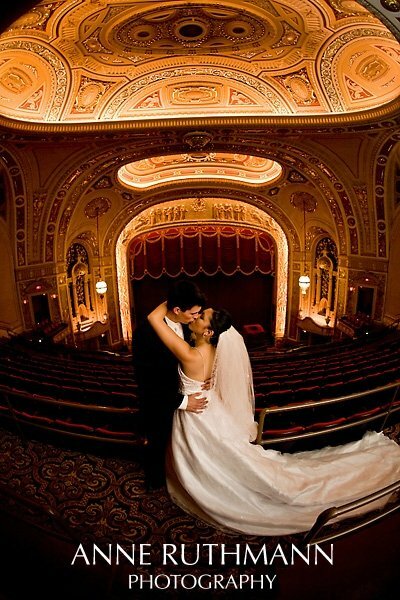 I can't say enough how perfect this venue is”. 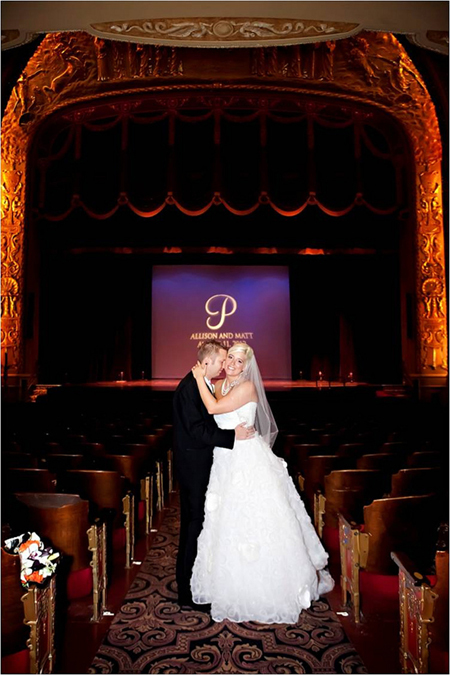 Randi C.
Have Questions? 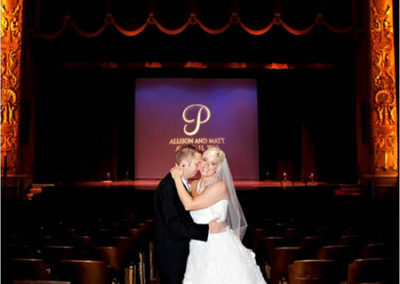 Ready to Book Your Wedding and/or Reception? Contact us today with questions or to book today.